Summer provides countless opportunities to get outside for hiking, biking and running around with friends and family. However, having fun in the sun also requires proper hydration. While staying hydrated may seem easy, healthy hydration is not always a given. For example, the water coming out of your faucet can travel through miles of aging pipes before it reaches your home, potentially picking up unwanted contaminants such as lead, pesticides and industrial pollutants along the way. Drink Plenty of Water. It may seem simple, but consuming an appropriate amount of water can be especially important when temperatures reach sweltering levels. Since the human body is 60 percent water, it’s a vital step for your health to make sure you’re getting enough of it, which is why Healthline recommends 6-8 glasses (8 ounces each) of water per day. Make Sure It’s Pure. In addition to drinking the right amount of water, it’s also important to drink the right kind of water. 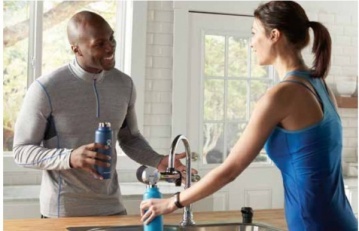 Consider installing an in-home filtered water solution like the PUR Advanced Faucet Filtration system. It’s certified to reduce more than 70 contaminants, including 99 percent of lead – more than any other brand, according to NSF. Filtered water can be used to refill water bottles and ice cube trays, prepare infant formula, cook and make beverages like coffee, tea and even smoothies. Take It To Go. Keeping a bottle of water with you when you’re out and about is a convenient way to stay hydrated. Rather than disposable plastic water bottles, consider using a refillable, BPA-free bottle, which is a more environmentally friendly choice and typically more affordable. Add a Little Flavor. Quench your thirst and add some refreshing flavor and nutrients to your water by infusing it with strawberries, kiwi, orange, mint or melon slices. Eat Water-Rich Foods. An overlooked option for maintaining proper hydration is eating fruits and vegetables such as watermelon, cucumbers and celery that naturally contain water. For the freshest results, wash your fruits and vegetables with filtered water prior to eating them. Find more ways to ensure cleaner water consumption for proper summer hydration at PUR.com.